The hard wearing anti-bacterial powder coating for the most stringent hygienic environment. 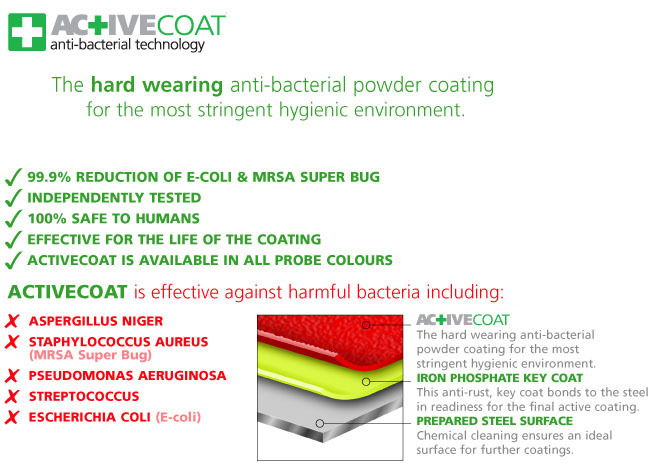 ACTIVE COAT is a new, hard wearing, patent-protected anti-bacterial powder coating containing elemental Silver ionically bonded into a bio-compatible ceramic material known as a Zeolite. This impedes the growth and migration of potentially harmful bacteria, mold, fungi, algae and more reducing the risk of cross-contamination from surface to surface. Especially suitable where stringent hygiene standards are required, such as health care, educational, catering and retail changing rooms. Probe ACTIVECOAT is Developed in conjunction with DUPONT – The miracles of science.